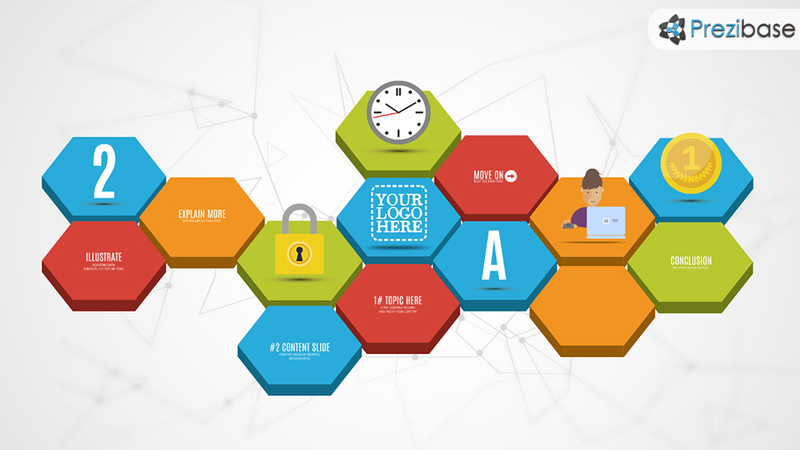 A customizable Prezi Presentation Template with colorful 3D hexagons. Build your own presentation layout, move the hexagons, and illustrate with icons, letters or symbols. Colors included: red, blue, orange, green. 2 Example layout included. Add your own background image and build the presentation you need. Create your own mindmap or a simple diagram layout for explaining a topic. This entry was posted in Best Prezi presentation templates and tagged 3d design, 3d hexgons presentation, 3d hive, 3d modules, 6, basic, business hexagons, colorful hexagons, customizable, diagram, frames, hex, hexagon design, hexgon, hexgon presentation layout, hive, layout hexagons, modular, modules, prezi template, prezi templates, shapes, sides, slides.